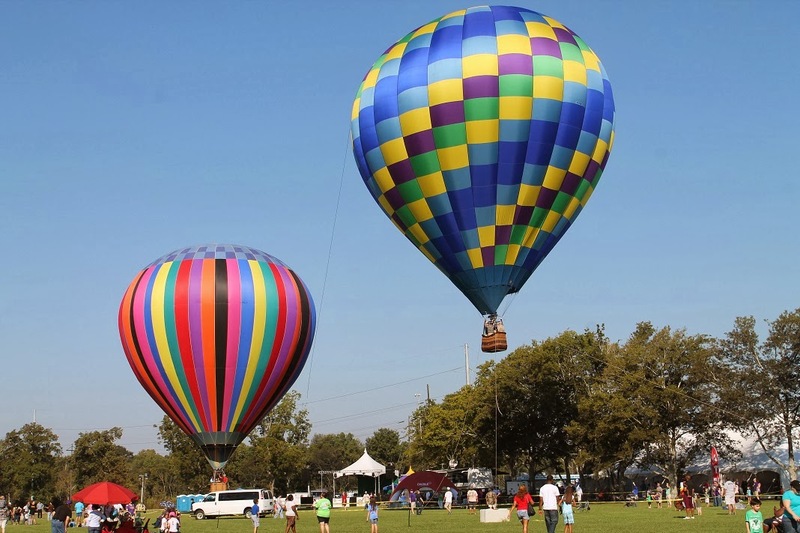 We went to the Ascension Parish Hot Air Balloon festival this past weekend and had an amazing time. They also had a kids area that was a ton of fun for Jane. 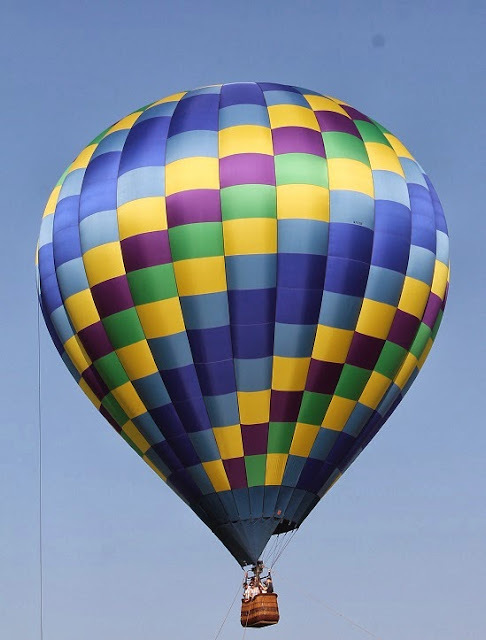 My favorite balloon was the stripey one. 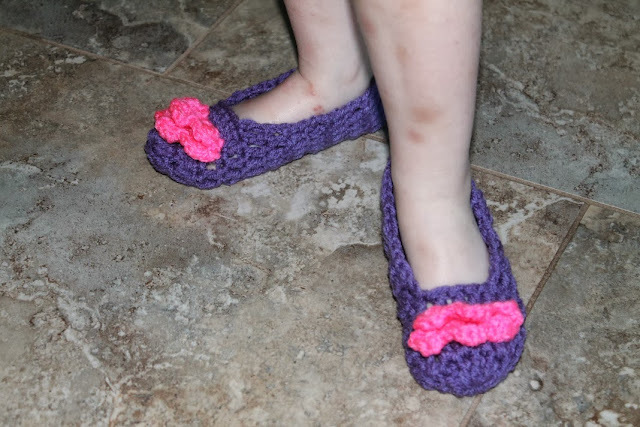 I made the pink ruffle based on the cloud pattern in Walker Whimsy’s rainbow scarf then sewed them on the toe. Really like the look of it. The whole thing probably took me less than an hour total. Jane's legs are a little roughed up because she got some ant bites and is just generally a rough-and-tumble little girl. She's one tough cookie! I've been a bit obsessed about the idea of a birthday party for Jane, which we'll have when we're visiting her grandparents just before her actual birthday. I spent a fair bit of time pinning, planning and thinking. And like most of my grand plans, this one has been scaled back considerably. Gone are my ideas for rainbow everything, including trying to make a rainbow layer cake (with fruit and veggies as the dye). Even so, I'm still focused on feeding Jane whole, good foods as much as I can, and I don't want that to change even at her birthday party. 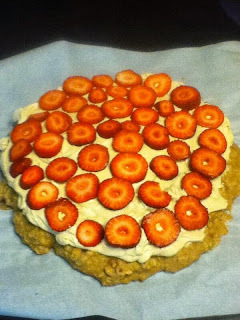 A friend suggested a fruit pizza, but all the recipes I found were a heavy sugar cookie crust with a cream cheese and sugar frosting. Tasty for sure, but not what I want to put in Jane's tummy. I kept googling and found a healthier version on The Yummy Life. Jane wasn't especially helpful, and this was our first time trying to do a project together in the kitchen. I only got really upset twice, which is pretty good for me. I'm finding my patience is very tested at this age (mine and Jane's) ... but that's another post entirely. We had on our aprons, we had our ingredients and her step stool (made by her daddy, and I can't believe I don't have a post about that). We got to work. The recipe itself was very easy and things came together fine. The peanut butter and Greek yogurt mix actually turned into a frosting-like consistency, which surprised me. Jane loved licking the spoon on that one too! She kept asking for "bite?" My pizza pan is bigger than 12 inches, so I didn't spread the oatmeal cookie dough crust out to the edges. I think I should have, because that would have been a thinner crust, which would have been better. And I had twice as much frosting as I needed -- I think if I'd only put half the recipe on the crust it would have been less overpowering (Shawn didn't like the frosting and doesn't think we should serve this at her party because it's a little weird). I also should have had more fruit and/or really layered on the strawberries more than I did. More fruit would have cut the creamy peanut butter yogurt intensity I think. I also wonder about making cookies -- just dropping and pressing balls of dough -- and then icing and topping with a bit of fruit. Maybe that would be more palatable? (Although that loses the option of a double rainbow it would be cheaper since there wouldn't be so many varieties of fruit to buy.) I don't want to make something that no one wants to eat. But I also don't want to just buy a grocery store cake and pump my kid (and others' kids!) full of sugar and food dye and the like. What's a pseudo hippie mama to do? To satisfy others' needs for cake (and maybe in lieu of the fruit pizza entirely) I am planning to make a couple bundt cakes of some sort and using a pumpkin colored icing (colored via actual pumpkin puree if it actually works). The idea being to stack them and make it look like an actual pumpkin, since Jane is our pumpkin girl. More testing to come. A little video that was forwarded to me that I thought you might like. Random: the biggest butterfly I've ever seen (seriously, the size of a robin or something) was flying around in the back yard while I was doing my exercise today. Maybe it will come back when Jane's awake so she can see it too. Not only did American Airlines damage my City Mini stroller, but they also effectively destroyed the custom Baby Jogger bag it was being carried in. When we picked it up in Minneapolis the whole bag was wrapped in plastic and the zipper had been demolished and squished. Ugh. I was so tired from the travel I just wanted to leave. I knew it would be a big hassle, and I thought maybe we could deal with it on the phone later. I am SO GLAD Shawn insisted and went to talk to the baggage claim person because filing a damaged bag claim has to be done in person within four hours of picking up the bag. The woman Shawn talked to was the agent who said her hands were tied re: the damage to the stroller, but she did say she would approve a claim for the damaged bag. The next step was to send the bag in for repairs or to be replaced. Because we needed the bag in some form to return the stroller to Baton Rouge, we waited until we were home to take it to an American Airlines counter. (We were told it didn't matter where, and BTR was most convenient). I had called ahead and went at a less busy time, and the counter agent was relatively helpful (albeit dense ... he was going to throw the bag on the conveyer belt without shutting it at all. And I'm pretty sure that would have kept the bag from getting to the repair shop at all). I was given a bag tag number so I could track the bag on its way to Dallas should I need to, and he made it sound like no problem at all to keep tabs on it. I walked away $1 poorer (no one validates parking), but I felt like things would be fine, at least as far as the bag was concerned. Oh, haha. Joke's on me and all of that. I waited patiently (as patiently as a person like me can). thinking that these things take time, etc. 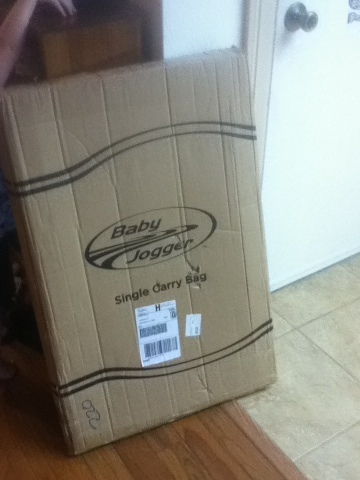 In my appealing for reconsideration for the damaged stroller I did find out that the bag was received on August 1 for repair. But as our next travel creeps closer I wanted to check in for any progress. When I started calling on Monday it had been about five weeks since I'd taken the bag in for damage repair. I think that's a reasonable amount of time to start looking for an update at least. I started with American Airlines Baggage Customer Service. Seems like a good place, right? Well, no. They don't handle damage claims at all. They are strictly about delayed luggage. Because the claim started in Minneapolis (with Shawn's smart move that gave us any chance of a claim). I was told to call MSP and leave a message with my file locator and call back number. Someone answered and was very rude/unpleasant. She didn't want to talk to me and it was clear she didn't feel well -- there was a lot of hacking plus mega noise in the background. In the end she told me that I should call "Ryan" and gave me a number. She said to use the same reference number to get information. I called "Ryan," which I thought was a person. It turned out to be Rynn's Luggage -- and I had to leave a message there. I gave the reference number and my call back. Of course the return call came while I was out on a quick errand several hours later, but that was OK. She left the information that Rynn had told American on August 7 (i.e., over a month ago!) that the bag is not repairable, and it's up to them to take the next step of replacing it for me. She suggested I call American's main baggage number, option 7. I did that, la-de-da, thinking that surely with this amount of information I could get the whereabouts of the bag, at the very least since it has probably been sent back to American Airlines, or in my wildest dreams a new bag. Of course I get the b*tchiest woman ever -- and that brings out the b*tch in me (which can be formidable). She said she couldn't help and suggested calling wherever I left the bag. She was another who was unpleasant and very unhappy to talk to me. There's probably a recording out there somewhere with me shouting an expletive and hanging up. (Because I already had the Baton Rouge number from calling ahead before I went to drop off the bag.) Pretty ashamed of that behavior on my part. But moving on. So I call BTR and speak to a guy who is clearly out of his element. He has no idea what to do/how to check. He has no access and said he'll have to have his "lead" call me back. I assume that means his boss. He give me his name, as if that matters or will help, but I appreciated him trying and was very kind (I was feeling bad about screaming with the other lady too). Of course no one called back. So today I tried BTR again and spoke to someone different. He was not happy to talk to me either, but somehow he was less rude. I could tell he was at the counter and had customers waiting/other incompetent workers he was trying to help too. I asked if I could call back another time, but he said "I'm already in baggage system." In the end he had no information. He didn't even know the name of the luggage company that would be responsible for repairing or replacing the bag and he didn't know how I could find out. He was generally non-informed and non-helpful. I can understand that an individual employee can't know every detail of how the processes work, but I would assume that the information would be in "baggage system" or whatever computer program he was looking at. I got off the phone, explaining I'm still unsatisfied but know he has other customers to help. He apologized but in a kind of "well shucks" way. I decided to try Rynn Luggage again, since they had actually given me the most up-to-date information (August 7 date). Someone picked up, and it happened to be the general manager. He was very calm and kind, which was helpful to me because I was (and am) in a bit of a state about the whole thing. He asked me questions and I explained things as best I could. There may be a problem that BTR doesn't have access to information that MSP would have because that's where the claim originated so Rynn would have replied to MSP and BTR would never know. Lovely. But the MSP person had told me she had no information either, so I was stuck. Then he asked me how much the bag cost. $50 plus $10 shipping. He said "I'll just buy you a new bag." He had me email him the link to the bag and said that he would place the order today. MAYBE it will be ordered and I'll have a new bag, or maybe I'll have to keep calling and whining. 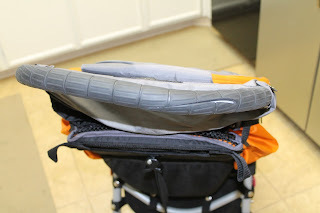 I have to do something so we can travel with our stroller this fall -- it happens to be on another airline (although I'm sure if it isn't the stroller and bag being damaged it will be something else). I don't know if there's a lesson in this -- other than persistence is needed when dealing with any kind of corporation. I certainly don't feel good about any of this and would just prefer that American Airlines take care of my luggage in the first place. I know things happen, and this is a thing. If I do get a replacement bag I'll know at least that much has been righted and can be satisfied. But I still can't say that I believe I will get a replacement bag. on the right. And the gripper should NOT be sliced like that. As I wrote about in July, American Airlines damaged my City Mini stroller, and the damage includes a very bent handle, a sliced handle gripper and other roughing up to the stroller frame. I asked him about the stroller itself and whether I could appeal the decision by the baggage employee in Minneapolis who told Shawn the company policy was a strict "we do not cover stroller damage." I detailed the damage and showed him how it looked almost intentional and how I couldn't imagine how something like this would have happened in normal air travel operations. He agreed but said he couldn't do anything/wasn't empowered to change this company directive. He told me I could call Central Baggage Service in Dallas to ask about an appeal. When I got home I did that (and BTR didn't validate parking so I was out $1 ... at least I had called ahead and didn't have to wait in a long line to talk to the guy). It took three phone calls to actually be connected to someone -- something kept happening with their system to kick me off. Then the representative told me the number I'd been given was only for delayed baggage. She couldn't help me with damage. She gave me another number, which took another three tries to get through -- and I found out I'd been re-routed to the original call center only dealing with delayed bags. ARGH! I explained the situation to the rep, and she asked a supervisor who told her to tell me to just email customer service as there isn't a phone number to talk to someone about damaged bags. Lovely. So I did email American Airlines customer service, not expecting any response or compensation. I got an automated "we got your message" as soon as I sent it. A few days later I did get a message from an actual person, and it included his name (although it was still from a do-not-reply address). The message was something like "decisions like this are left in the hands of our ground crew, but I'll ask our manager to review this and if he decides we can compensate you we'll be in touch." I appreciated the response, but I don't think they should be able to have it both ways -- the people on the ground saying corporate has this rule and we have no authority to change it and the people at corporate saying we can't do anything because the people on the ground have to make a decision at that time. ARGH! After more than week I wrote again (back in the form online that takes ages to fill out because it needs your flight number, time of departure, etc.) and expressed that feeling/trying to call bullsh*t on it and asked for a decision and some explanation either way. I had offered at every encounter to provide photos of the damage but no one ever took me up on it. I got another auto response. A few days later I got a reply from the same customer service rep again saying that the decision has to be made by the people on the ground. They're sorry I'm still upset, blah blah. Here's a $100 voucher for future flight on American Airlines. Hopefully your next flight with us will be better/we aim to serve you. Ugh. The damage to the stroller was more like $150, so I guess I should feel glad to have recouped most of the cost (although am I really going to buy a new stroller frame and basket? I haven't yet.). But the whole thing has left a bitter taste in my mouth. I'm not sure how we'll travel with our stroller in the future, but I know we will (assuming we can get our stroller bag back ... must check on that soon). I guess I just wish the customer service was less about CYA and more about actually taking responsibility for doing something wrong -- namely effing up a piece of luggage. There's nothing more I can do about it now, but I thought I would write it out for those who might be interested -- and in solidarity if anyone ever Googles for "American Airline stroller damage." I also realize how small an issue this really is in light of the big picture -- both of the world at large and my life overall. It's quite annoying in any case, and I'm trying to keep it in perspective even as I write about it nonstop. Thanks for bearing with me. This Huffington Post article made the rounds on Facebook a few weeks ago. 23 Signs You're Secretly an Introvert had several of my FB friends outing themselves as introverts and citing specifically which "signs" applied to them. I kept thinking about it too, as some of the signs definitely apply to me. My introversion is no secret though. I am no good at small talk (sign #1), or at least I don't feel good at it. I dislike being in big crowds of people, even if I know most of them. Case in point is the weekly "coffee time" at church. Gag. I'm also not a fan of passing the peace during the service, but that's a bit of germ-a-phobia too. My intensity (#5) can get me too. Recently a friend reminded me of something randomly personal I told her when we'd first met. Yikes. I had wiped that from my memory banks, but it definitely applies to the "you're too intense" sign of introversion. Geez. The inner monologue sign (#16) is funny -- and I think there were some silly comments from my FB friends ... something like "doesn't EVERYONE have an inner narrator? And isn't he British?!" Mine isn't British, but I certainly think "aloud" to myself plenty. Possibly that stems from wanting to be like Angela Chase though! I wouldn't necessarily link writing (#22) to introversion, but I get that. I DEFINITELY prefer the written word for all kinds of communication. It's more efficient to me, and I'm able to ruminate more (too much in many cases!) before actually communicating. It's something I always have to work on in my professional life and really push myself. But I am trying to use it for my good. A writer's gotta write after all, introvert or not! Most of the other "signs" probably apply to me too, but these were the four that popped at me and had me nodding my head when I first read the article. My "mind-the-rules" mentality jumped in my throat as the flight attendant made her announcements, including "There can be nothing in the seat back pocket -- no iPads, no books, no water bottles, nothing. 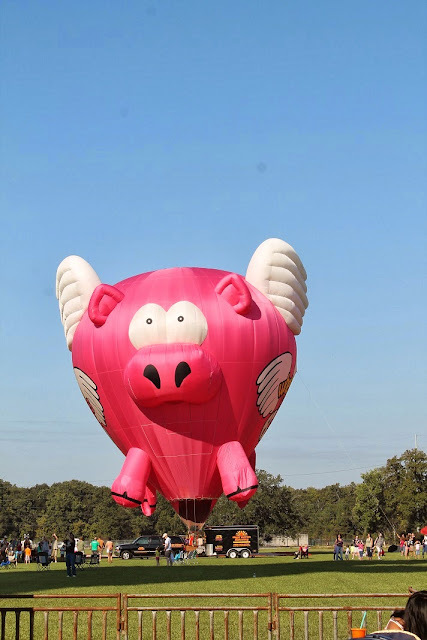 It's an FAA regulation, so don't shoot the messenger." She then proceeded to march down the aisle checking people's laps for seatbelts, and presumably pockets for contraband baggage. I had a squirmy toddler in my lap, a grumpy old man on my left and my Zo&Co Travel Tote in the seat back pocket -- full of stuff Jane would need for the flight. I had heard this message once before -- on another flight -- but it hadn't been enforced then. And thankfully it wasn't enforced on this flight either. I certainly would have complied if she had asked me directly though -- but I'm not sure how I would have juggled everything without seriously angering my seat mate. Back home I Googled the regulation and found out it's a recommendation by the FAA, and flight attendants enforce it differently -- it varies airline to airline and even flight to flight. One person even wrote about a flight attendant who wouldn't let him put his ticket stub in the seat back pocket! The reasoning is that something heavy in the pocket could fly out during take off or landing and then hurt someone. Seems like a moot point when I'm holding a 25+ pound toddler in my lap, but I see the point and had NEVER considered that before even having been on dozens of flights in my lifetime. I still love the travel tote and will continue to use it to situate ourselves on the plane. Without a toddler en tow it would be easier to have the tote stashed under the seat and then pull it out after take off. Maybe on future travel after November 8? Last week I spent a lot of time in a nursing home. To be clear I wasn't living there, but I was visiting my Gran who was there temporarily (she went back to her home on Saturday). Jane and I would spend most of the morning with her in her small room, go to my sister's house for lunch and a nap, and then back to the nursing home until dinnertime. Keeping a toddler entertained in a confined space full of buttons not to be pushed and needing to be somewhat quiet was difficult to say the least. But being there provided food for thought and opportunity for reflection between toddler tackles. Being in that environment raises a lot of questions about dignity -- and how to maintain it for our elders. I also couldn't help but extrapolate and think about myself at that age -- if I could decide how I'd like to decline would I want to keep my physical capacity while giving up mental acumen (like my great aunt who lives in a different nursing home and whom we also went to visit)? Or would I want to stay sharp and be fully aware of what's going on yet not be able to physically care for myself in simple ways? There's no good answer, but it is a reminder that I'm not invincible and this body is aging like everyone else's. Somehow I had forgotten the true depth of the heat in southwest Oklahoma. While we were there last week the highs were in the triple digits. I think 109 was the hottest it got. In the evenings it may have gotten some cooler (so the swing is bigger than it is here in Baton Rouge), but the sting of that hot sun upon walking out the door from air conditioning is a shock. The sun seems brighter, the glare is stronger and there were no clouds or real shade to be found most of the time. If there was wind I didn't notice, although I would assume it would be a fiery wind without cooling ability. But now we're home. Yesterday when I got out of my car in the shade and didn't feel I was catching fire I breathed a sigh of pleasure -- even though it was 90 degrees and high swampy humidity. I don't know if my body has adjusted to this Baton Rouge summer weather or if the Oklahoma heat always had that kind of effect on me. After spending a week with Beth I keep catching glimpses of her in the mirror -- like the way I hold my face or something. I'm not sure if it's because I'm mimicking her after being around her or if I always look so much like her and only notice if we've been together a bit. We haven't taken a picture together in years, so you'll just have to take my word for it... And maybe this will remind me that we should take pictures together rather than just of our children (who also can have very similar facial expressions).